By the time these patients reach the surgeon, the diverticula have attained sufficient dimensions to warrant surgical excision in practically every instance. I have found few, if any, contraindications to operation. Nowadays, with our better understanding of the details of preoperative preparation, it is rare to encounter any contraindicating factor. Fig. 6. A Zenker’s divertic­ulum depicting irregularity of the upper portion at the site of a squamous cell carcinoma. Preoperative preparation of the patient should include washing out of the sac contents by the method of drinking many glasses of water and the emptying of the sac by the patient, who usually has developed his own method of accomplishing this. I believe this repeated act of mechanical cleansing of the sac is probably more effective than the use of an antibiotic solution which has been recommended to minimize the risk of local postoperative infection. For many years, I employed an indwelling Levin tube, passed by the anesthetist during the operation after exposure of the sac and guided into the esophagus by the surgeon. Although it serves the useful purpose of early feeding, I have stopped using it because of the unnecessary discomfort to the patient and because it really is not necessary. In fact, its very presence near the esophageal suture line may have unforeseen pressure effects. Although the operation of diverticulectomy can be done under local and re­gional procaine anesthesia, I would urge general intratracheal anesthesia as the method of choice. This should be skillfully done to prevent undue postoperative vomiting or retching which might adversely affect the suture line in the esophagus. The operation for excision of a Zenker’s diverticulum is certainly not difficult, but it does require a knowledge of the anatomy of the neck and a technical facility in the proper suturing of the esophagus. I have always preferred an oblique incision along the anterior border of the left sternocleidomastoid muscle because it gives a direct approach to the site of the diverticulum and leaves a barely notice­able scar (Fig. 7A). Some surgeons recommend a collar incision. The left-sided incision is used because the diverticulum usually deviates toward the left rather than the right. But, if the surgeon happens to be left handed, he will be more at ease if he makes the incision on the right side. There is really very little difference in the extent of exposure. The incision should be of liberal length. In cutting through the platysma, the surgeon should avoid injury to a sensory branch of the cervical plexus as it crosses the upper part of the incision. It is desirable to clamp and tie all bleeders as one progresses, using fine silk for this purpose. I have always used an all-silk technique in the performance of this operation. A dry field at all times simplifies the operation considerably. Retraction of the sternomastoid outward brings into view the outer edges of the prethyroid muscles and the “looping” omohyoid. The latter can be retracted up­ward and the former mesially, thus disclosing the left lobe of the thyroid. Ligation and division of the middle thyroid vein permits retraction of the thyroid lobe mesially. 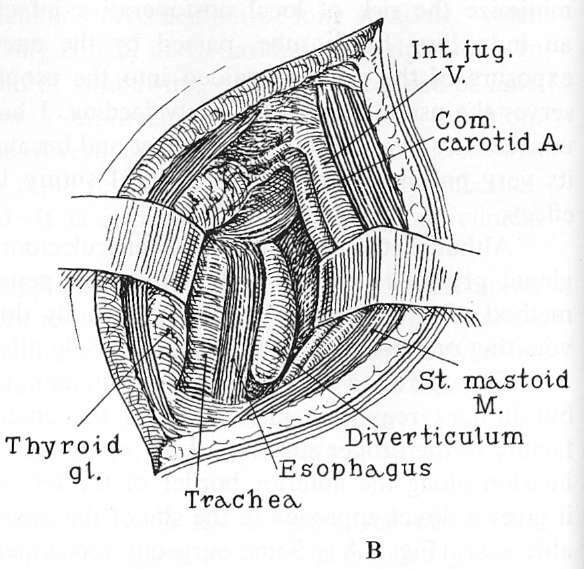 By blunt dissection, the surgeon now enters the space between the esoph­agus and prevertebral fascia, bringing into view the diverticulum which hangs down behind the esophagus (Fig. 7B). If one grasps the lower part of the sac with a nontraumatizing clamp, it is possible to swing the diverticulum outward, thus expediting its mobilization by the process of snipping the areolar tissue which binds it loosely to the surrounding structures. The dissection should now be continued up to the neck of the sac at its point of origin. It is at this region that one begins to recognize muscle tissue which is incised in a circumferential manner. As this is being done small vessels will be encountered which should be divided between mosquito clamps and ligated. A dry field at all times makes visualization of the mucosa and muscle layers for accurate suturing infinitely easier. Every effort should be made to preserve all muscle tissue for a thorough closure. Fig. 7. 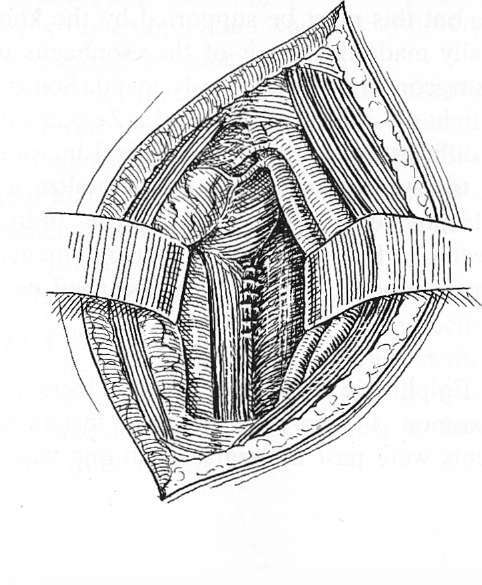 A, The position of the incision for the removal of a Zenker’s diverticulum along the anterior border of the sternomastoid muscle. 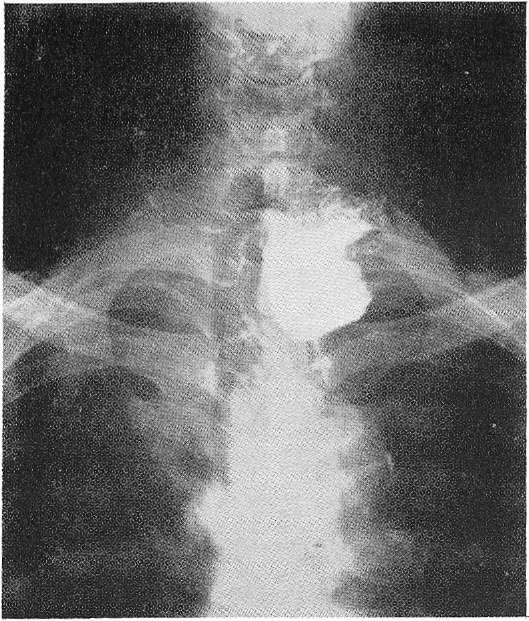 B, Exposure of the retroeso­phageal diverticulum by retraction of the prethyroid muscles and thyroid gland mesially and the great vessels laterally. 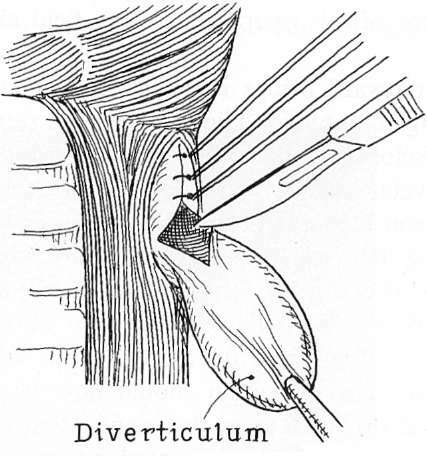 The diverticulum lies anterior to the prevertebra fascia. Fig. 8. Method of excision of the diverticulum piecemeal with repair of the mucosa as the excision progresses. the pharyngeal and esophageal wall will be removed, producing a constriction. I have found that the most effective method of removing the diverticulum is to do it piecemeal (Fig. 8). Starting at the upper end (in the vast majority, the repair is made in a vertical direction), the neck is cut across about one quarter of an inch. The resulting opening is closed with 000 or 0000 silk. I do not think it makes much difference whether or not the knot faces inside the esophagus. I have used both methods and have noted little, if any, variation in healing. Another snip of the neck is followed by another stitch. This process is continued until the lower­most portion where the last suture is placed. Some authors stress the fact that there may be a web partially blocking the esophagus just below the neck of the diverticulum and advise inserting a finger into the esophagus before completely closing the neck orifice. If one is found, it should be excised. In a personal series of 92 Zenker’s diverticula, I have encountered this sort of web only once. The previously preserved muscle edges should now be approximated carefully as a second layer, using the same type of suture material (Fig. 9). The secureness of the muscle closure is the best insurance against recurrence. In placing the sutures for the closure, the surgeon should avoid taking large bites anteriorly to obviate inadvertent inclusion of a recurrent laryngeal nerve which may have been displaced from its usual position in the tracheoesophageal groove. I always insert a narrow strip of gauze packing toward the superior mediastinum at the lower angle of the incision. It serves to wall off the mediastinum by the formation of granulation tissue and is removed after three or four days. 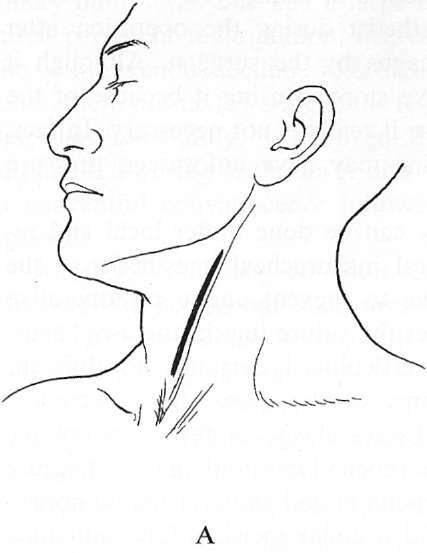 When the retractors are removed, the neck muscules fall together into their normal relationships. The platysma is then closed with 0000 silk, and the skin is approximated with either silk sutures or Michel clips. Fig. 9. 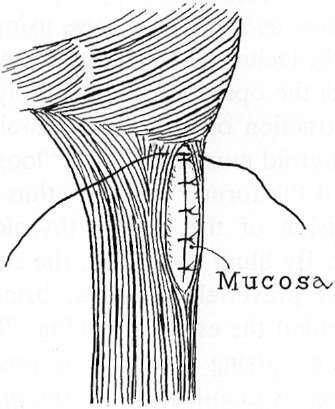 The completed repair of the muscle layer. This must be ac­curately performed. Postoperatively, the care of these patients is simple. Swallowing is not per­mitted until the third or fourth day. A continuous intravenous drip is maintained (2,500 to 3,000 ml in 24 hours) until the patient is able to take sufficient fluid by mouth. Maintaining normal fluid and electrolyte balance is an important tant feature of the postoperative care in the first week. Swallowing of sips of water may be started on the third or fourth day, with daily increase in amount. By the sixth day, a diversified fluid intake is possible, and the intravenous drip is dis­continued. The swallowing of soft food is commenced on the seventh day and gradually increased until discharge of the patient on the eighth day. The skin sutures or clips are removed on the third day when the packing is also withdrawn. Unless some definite indication exists, I do not administer antibiotic drugs postoperatively. For many years I have been strongly opposed to the practice of routine prophylactic postoperative antibiotic therapy. Unfortunately, it is fairly gen­erally employed not only in the United States but also in other parts of the world. Aside from the bacteriological aspects of the problem, this practice has had the elfect of lowering standards in operating room technique. The time-honored basic principles of surgical technique are being forgotten under the spell of the sup­posedly beneficient effects of the antibiotic drugs. This opinion is being supported by an increasing number of articles appearing in the surgical literature. I would par­ticularly refer the reader to a most enlightening paper on this subject by Johnstone which appeared in Surgery, Gynecology & Obstetrics for January 1963. Everyone should be convinced by the simplicity of the experiment and the starting results reported in this paper. In the postoperative period, a number of complications may occur, and the surgeon should be aware of such possibilities. Occasionally, a leak may occur at the suture line with the appearance of esophageal contents in the neck drainage tract. This happened five times in our series. All healed spontaneously after 10 to 14 days. The treatment consisted of cessation of fluid and food intake and the reinstitution of intravenous therapy. These were undoubtedly minute fistulas, which explains the rapid healing. A major breakdown of the suture line would pose serious problems, with prolongation of the healing period. I would hazard the opinion that reopening of the wound with the object of repairing the fistula by suture would not be successful. Packing of the area with gauze to stimulate the formation of granula­tion tissue should be more effective. Another complication occasionally observed is hoarseness, appearing the day after operation. This may be due either to trauma by the intratracheal tube during induction of anesthesia or to pressure on the left recurrent nerve by a retractor during operation. This was noted a few times, and in each instance complete recov­ery ensued. Finally, mild dysphagia may become evident in the early days of con­valescence. This is probably due to edema of the tissues at the site of repair, which usually subsides after five or six days. Reassurance of the patient is needed at this time, but this must be supported by the knowledge of the surgeon that he has not actually made the repair of the esophagus too tight. This eventuality is something the surgeon must scrupulously avoid. Some years ago, I saw two patients who had had tight closures at the neck of a Zenker’s diverticulum. Correction of the stricture was difficult and consisted of vertical incision at the site of obstruction with closure in a transverse direction. I can visualize a situation where this simple expedient would not be possible, thus requiring more extensive and complicated surgery to correct a serious defect. The best treatment is prevention. If the original operation is done properly, this complication need never occur. I wonder how much attempt you put to make one of these great informative site. I’ve been through this ! for me to pay a visit this web page, it contains priceless Information.